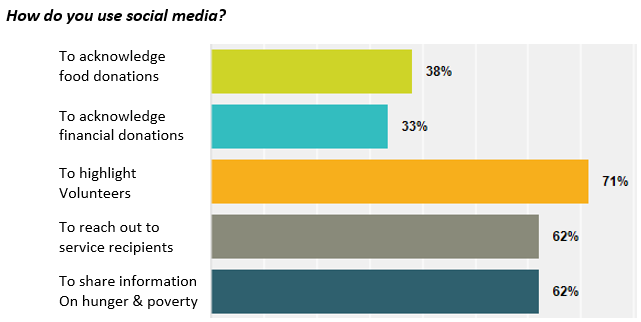 Of the forty agencies that responded, 55% indicated that they use some form of social media to support their work while 45% said they do not. 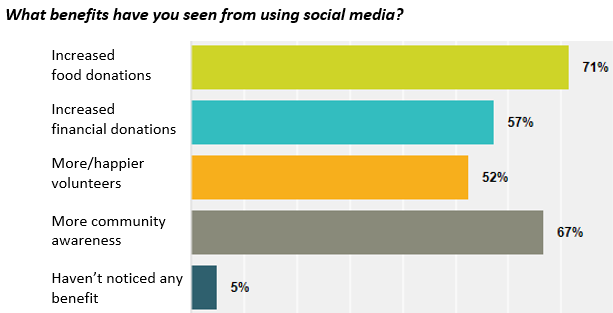 Of those that do not use social media, almost half responded that they do not have a computer to use for this purpose, and 41% responded that they do not have a staff or volunteer who knows how to use social media. Of those agencies that do use social media, 90% use Facebook while 10% use Google+. Three quarters have a volunteer maintaining their social media account, while 25% have paid staff for this work. Two thirds of agencies reported spending less than an hour updating social media, while the other third report spending less than two hours a week on this task. Our Facebook site reaches more people with the tap of a button than we can any other way...at every fundraising event we always ask how they heard about what was going on and we hear Facebook 9 out of 10 times...the other 1% heard from a friend who saw it on FB!!! Due to posting opportunities at the pantry we have seen an increase in volunteerism and some of those volunteers have become key financial donors. We needed several items at the last minute for a holiday meal and posted on Facebook about it. Someone who saw our post brought in a bag of donations that was exactly what we needed. A new client private messaged me after seeing that we would be open the following day. She told me her situation and asked several questions…. I was able to get back to her within a few hours and made sure she would have food the following day. Thanks to all who responded. A drawing for a store gift card will be held in late-May, and the winner will be announced in June’s newsletter.